Human capital refers to the productive capacity embodied in individual human beings. Since formal education is a major way individuals acquire productive skills, years of schooling and human capital should be related. The two measures, however, are not equivalent. Hall and Jones (1999), for example, find that in a sample of developed and developing countries the return to education falls with years of education, implying that each additional year of schooling adds less and less to the stock of human capital. In their analysis human capital is treated as a homogeneous entity, an acceptable practice in many settings, but we are well aware, of course, that it can take various forms. While basic skills such as reading and writing, for example, may be widely applicable in many activities, others skills may be useful in only a few. The distribution of skills in an economy may be important in determining the relationship between years of schooling and the amount of human capital. Imagine a country whose distribution of skills, given each person’s years of education and its stock of physical capital, maximizes its total product. Now consider changing the skill distribution while holding constant each person’s years of education (for example some plumbers are turned into carpenters). While the level of education has remained constant, productivity has declined because educational expenditure has been redirected into less productive forms. The amount of the aggregate human capital in this imaginary society has declined. In economies where most prices are market determined, and where individuals reap most of the benefits and bear most of the costs of their decisions of what skills to invest in, we would expect productivity to play an important role in how individuals make those decisions. In such societies investment in education may not maximize income—after all, different skills differ in their non-pecuniary returns—but it should not stray too far from that aim. There is no reason to believe this is also the case for centrally planned economies, where the same processes that governed other economic decisions governed investment in education. It is now clear that the transitions to market-oriented economies have involved considerable reallocation of labor, implying that the skill distributions that developed in those societies under planning were not the most appropriate for market economies (Boeri and Terrell 2002). It also suggests that educational levels overestimate the level of human capital in those societies. We can get an idea of how much of an overestimate by comparing rates of return to education. For the early years of the transition, the average return to education for the Czech Republic, Poland, and Russia is about one third lower than the return in the U.S. in 1989 (Boeri and Terrell 2002). Taken at face value, this implies that estimating human capital on the basis of years of education could result in an overestimate of as much as one third. In Locay (2003) I investigated this question for the case of Cuba. While we cannot know what is the skill distribution that would arise in a market-oriented Cuba, it seemed reasonable to assume that it would be somewhere within the variation we observe in Latin America. I therefore measured how much each country’s employment by broad industry (sector) and occupational categories differed from the mean distribution of a sample of Latin American countries. The same calculation was performed for post-secondary fields of study. In all three cases Cuba deviated most from the sample mean distribution. While the results in Locay (2003) are consistent with the idea that Cuba’s skill distribution deviates considerably from what would exist in a market oriented economy, there may be other plausible explanations for these findings. This paper pursues the matter further by looking at the transition economies of Eastern Europe and the former Soviet Union to see whether comparable measures of labor market deviation or distortion correlates with economic performance during the transition to a market-oriented economy. The organization of the paper is as follows. 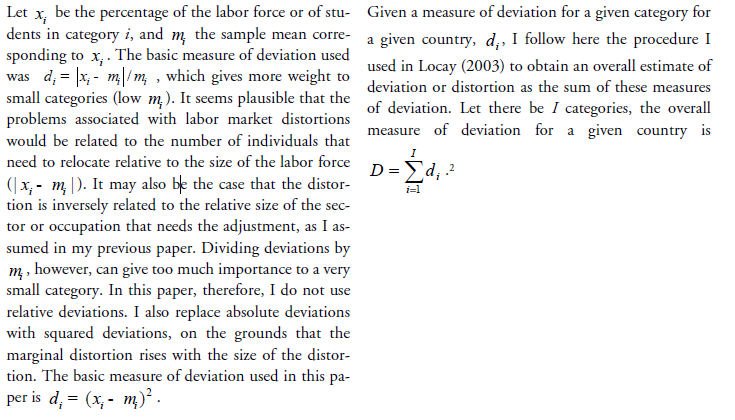 In the first section I discuss the methodology used in constructing measures of deviation, and how it differs from that in Locay (2003). The second section follows with recalculations of the measures of deviation for Cuba using the new methodology. The next three sections are the heart of the paper. In the third and fourth sections I calculate how much the pre-transition distribution of the labor force of various economies of Eastern Europe and the former Soviet Union deviated in terms of broad industry (sector) and occupational categories from the distribution of a comparison group of market economies, and I investigate if such deviations are related to real GDP per capita growth during the first ten years of the transition. In the fifth section I carry out the same analysis for university graduates by fields of study. I conclude in the sixth section. 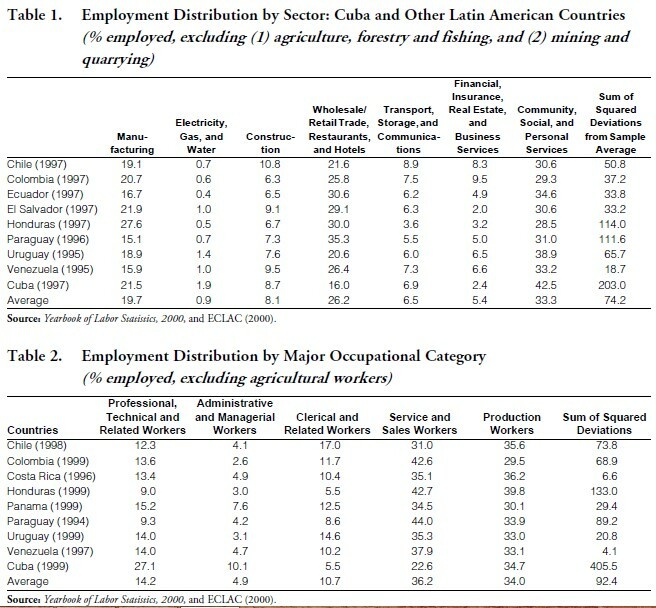 In Locay (2003) I compared Cuba’s employment distributions by very broad industry and occupational categories, as well as its distribution of post-secondary fields of study, with those of other Latin American countries for which data were available. The procedure I followed was to derive a measure of how much each country deviated from the sample mean distributions. The basic measure of deviation used was the absolute value of the deviation from the sample mean relative to the sample mean. In the case of Cuba it seemed natural to compare it to other countries in Latin America. What marketoriented country or group of countries were to form the standard of comparison for the economies of Eastern Europe and the former Soviet Union was less obvious. The procedure I used was to include in the comparison group market economies of Europe that in 1985 had levels of GDP/capita that were around the upper levels found in the eastern bloc.3 These are the poorer countries of Europe at the time, and the group consists of Cyprus, Greece, Ireland, Portugal, Spain and Turkey. I chose 1989 as the start of the transition in Eastern Europe, and 1990 as the start in countries of the former Soviet Union. The 1989 date was used for the Czech and Slovak Republics, even though those countries did not separate until later. For many countries of the region data is not available until well after the transition. Such countries had to be excluded. As in Locay (2003), in this paper I have excluded agriculture and mining in computing the distribution of the labor force by sector (industry).4 The reason for this exclusion continues to be that these sectors are too sensitive to the level of economic development and the presence of natural resources. The sample for the analysis of the distribution by sector consists of 11 countries. Unlike Locay (2003), I excluded agricultural workers. For some countries there is data on employment by occupation by industry. Whenever this was the case, persons working in agriculture could be removed from each occupation. For this group of countries agricultural workers were overwhelmingly classified as production workers in terms of occupational category. For those countries that did not provide data on occupation by industry I assumed that all agricultural workers were production workers. Suitable data on occupation for the formerly centrally planned economies was very scarce. The sample consists of only three countries, and the data corresponds to older and more varied dates than I would have liked. Fields of study were grouped as in Locay (2003). Only graduates were used, and not enrollments, because the data referred to 1993. Most graduates in 1993 would have at least begun their studies near the time of transition. This could not be said of enrollments. In Tables 2 and 3 appear the corresponding calculations for broad occupational categories. 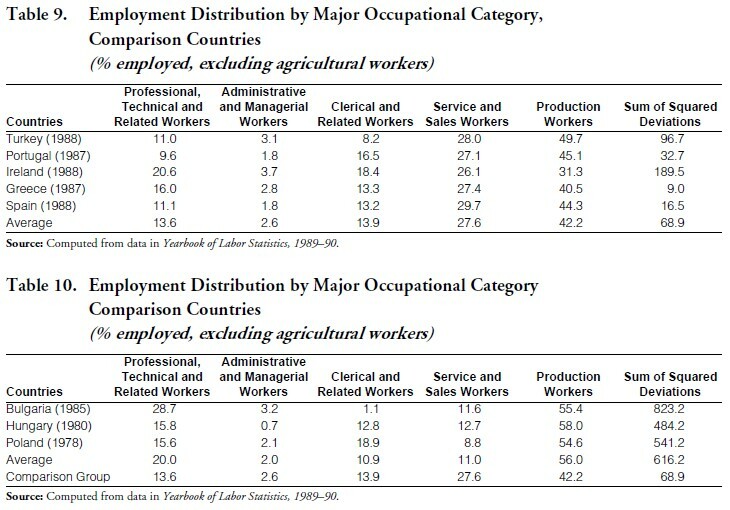 Table 3 includes more countries, but it is limited to three occupational categories. Again we see that Cuba has the highest sum of squared deviations in the two samples. When Cuba is excluded from the sample in Table 2, the mean sum of squared deviations drops to 46.9, with a standard error of 34.5. Cuba’s sum of squared deviations of 513.2 is 13.5 standard errors above the mean of the sample without Cuba. If the same is done for Table 3, the mean sum of squared deviations is 186.0 with a standard error of 193.2. Cuba’s sum of squared deviations of 755.0 is 2.94 standard errors above the sample mean. Tables 4 and 5 present data on post high school enrollments and graduates, by field of study, respectively. In principle the enrollment data would appear to be less instructive because students may change their majors or not complete their education. Furthermore, since enrollments measure individuals in the pipeline, fields that take longer to complete will have relatively higher percentages.6 The enrollment data, however, refers to a more recent period, so I present both. The by now familiar pattern can be seen in both tables. Cuba has the highest sum of squared deviations in both. When Cuba is excluded from the sample means, its sum of squared deviations are 10.4 and 4.2 standard errors greater than the sample mean for enrollments and graduates, respectively. 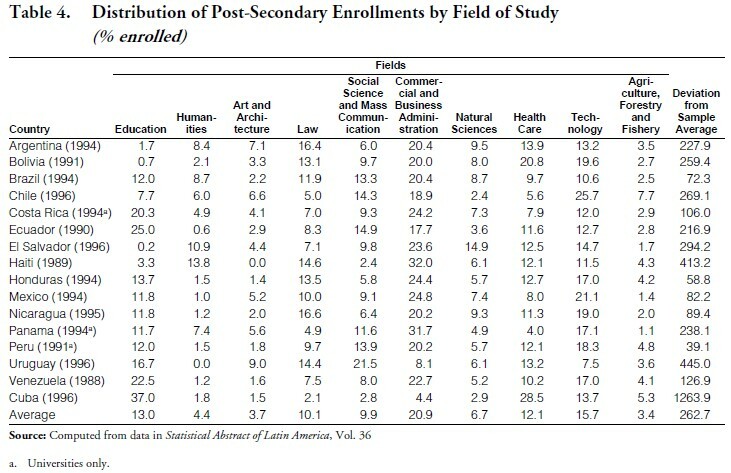 As in Locay (2003), Cuba deviates the most of any Latin American country in the sample in terms of employment distributions by very broad industry and occupational categories and in the distribution of post-secondary fields of study (all deviations are significant at conventional levels). In terms of industries, Cuba deviates the most from the Latin American averages in trade (retail and wholesale trade, restaurants and hotels) and in community, social and personal services. For the former, Cuba is 10.2 percentage points below the average, while for the latter it is 9.2 percentage points above. In terms of occupations, Cuba is particularly heavy in professional, technical and administrative workers, and light in clerical, service and sales workers. In post secondary fields of study Cuba is very high in education, and particularly low in business and law. We begin by first looking at the distribution of the labor force by sector for the comparison group of European market-oriented economies. The results are presented in Table 6. As can be seen, the distributions are quite similar, with the sum of squared deviations ranging from 7.9 to 50.3. Table 7 shows the corresponding information for a sample of transition economies. As expected, the transition economies deviate more from the average distribution of the market economies, than do the market economies, with the sum of squared deviations ranging from 150.4 to 874.0. Without exception, the transition economies have a smaller percentage of their labor force in what we can call trade (retail and wholesale trade, and restaurants and hotels) than the market economies. This is similar to Cuba relative to Latin America. With one exception (Kyrgyz Republic), the transition economies have more of their labor force in manufacturing and less in community, social and personal services than the average of the sample of market economies. This contrasts with Cuba, which has the highest percentage of its labor force in community, social and personal services, and whose employment in manufacturing is within the range of those of the other Latin American countries in the sample. Table 8 shows the sum of squared deviations from Table 7 along with the corresponding average rates of growth per year of real GDP per capita for the first ten years of the transition period. For Eastern Europe the beginning of the transition is set to 1989, and for countries of the former Soviet Union it is set at 1990. As can be seen, there are five countries with positive growth. The average sum of squared deviations for this group is 192.4. For those with negative growth it is 355.5. Though the difference is very large (163.1), the smallness of the sample and its high variability means that the difference is significant only at the 11% level for a one-tailed t-test. If the sample is divided into Eastern European countries and those of the former Soviet Union, the difference in the sum of squared deviations between those that had positive growth and those with negative growth is larger for the former and smaller for the latter. For Eastern Europe the difference is 417.3 and significant at the 5% level. For countries of the former Soviet Union, the difference is of the anticipated sign but small (13.5) and insignificant. Cuba and the countries of Eastern Europe and the former Soviet Union all had low percentages of their labor forces in trade relative to their respective comparison groups. Consequently, I compared if transition countries with positive growth differed from those with negative growth with respect to the deviation of the percentage of employment in trade. The squared deviation from the standard of the percentage of employment in trade for those with positive growth is 67.3, while for those with negative growth it is 114.8. The difference of 47.5 is significant at the 5% level. Suppose we ask what would be the predicted ten-year growth rate of GDP/capita of a transition economy that differed in trade from the standard as much as Cuba does from the other Latin American countries in Table 1. Based on a linear regression of growth rates on the deviation of the percentage of employment in trade, the answer is –1.1%, or a growth experience similar to that of Latvia and Belarus. If the same exercise is done using the sum of squared deviations, we obtain a predicted growth rate of –0.7%. Table 9 shows the distribution of the labor force by broad occupational categories for the comparison market economies. These economies differ most from the market economies of Latin America (Table 2) in having appreciably more production workers and fewer service and sales workers. They also have somewhat fewer administrative and managerial workers and somewhat more clerical workers. Table 10 shows the corresponding data for the transition economies. Unfortunately, data on occupations have been more difficult to obtain. Not only is the sample smaller, but the data pertain to an earlier time period. Of the three countries in Table 10, Bulgaria is the one with an occupational profile most like Cuba’s. It exceeds its comparison group in professional, technical, administrative, managerial and production workers, while it has substantially fewer clerical, service and sales workers. All three countries have substantially lower shares of their labor force in service and sales than the comparison group, and more production workers. The former is consistent with the low percentage of the labor force in trade discussed above, and something that can be seen also for Cuba. In Table 10, only Bulgaria has a negative average rate of growth per year of real GDP per capita for the first ten years of the transition period. As can be seen from the table, it also has the highest sum of squared deviations. The difference in sum of squared deviations between Bulgaria and the average of the other two is significant at the 5% level (one-tail test). Cuba’s sum of squared deviations relative to other countries in Latin America, 513.2, would place it in the range of Hungary and Poland. That is, we would expect it to have modest positive growth. Its occupational profile, however, is most like Bulgaria’s, a country with poor growth performance. I begin this section with the by now familiar pattern of first reporting the results for the comparison group of market oriented economies. These are presented in Table 11. The most striking feature of this table is the large variation within market-oriented economies. Even though there are more categories, the sums of squared deviations are larger and more variable than for sectors or occupations. Table 12 shows the corresponding data for the transition economies. As can be seen, the data refer to the early nineties, after all the transitions were under way. Earlier data appear to exist for only a handful of transition countries. This should be more of a problem for enrollments than for graduates, most of who would have entered the pipeline just before the transition. For this reason I have not collected data on enrollments. Still, the transition may have impacted the distribution of graduates. 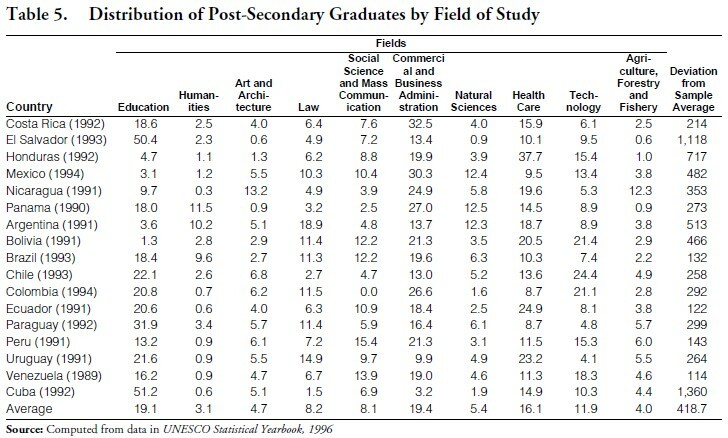 The relationship between the distributions of graduates by field of study for transition countries and the market economies in Table 12 is similar to that shown in Table 5 between Cuba and other countries of Latin America. 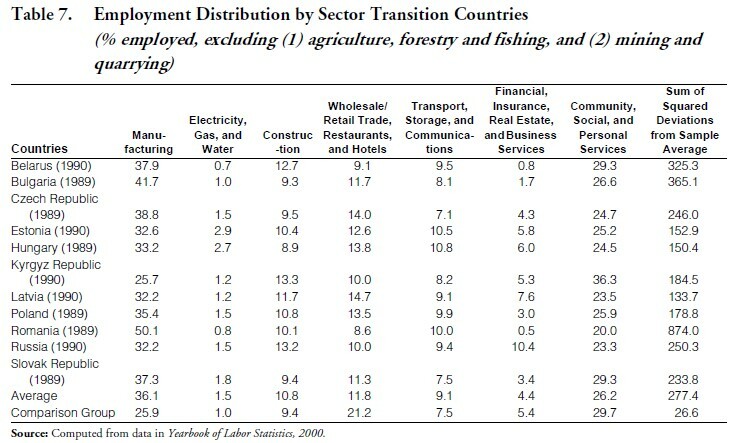 In every field but technology (engineering, trade, craft and industrial programs, transport and communications), the difference between the average of the transition countries and their comparison group is of the same sign as the difference between Cuba and the average for Latin American countries in the sample. Table 13 shows the sum of squared deviations and the ten-year average growth rate of real GDP/capita for transition countries. As can be seen, there is a rough negative correlation between the two. The sum of squared deviations for those countries with positive growth is 416.7, while for those with negative growth it is 713.1. The large difference of 296.4 is of the expected sign, but it is not statistically significant because of the large variability of the sample. Nevertheless, a regression of growth rates on the sum of squared deviations results in a negative coefficient that is significant (two-tailed test) at the 10% level. Based on this regression, we would predict that a country with a sum of squared deviations equal to that of what Cuba has relative to the other Latin American countries in the sample, would have a ten year average rate of growth of –3.88%. This growth rate is worse than for all but two of the transition economies in Table 13. Participation in some of the fields is strongly correlated with growth, but given that there are ten fields and only ten countries, some spurious correlation should be expected.7 Still, some correlations are suggestive. The two worst growth performers, the Kyrgyz Republic and Russia, for example, had the lowest percentage of graduates in law and commercial and business administration, a pattern reminiscent of Cuba relative to other Latin American countries in the sample. The results described above are quite consistent. Transition economies with negative growth rates of GDP/capita over the first ten years of the transition had distributions of workers and students that deviate more from those of a sample of market-oriented economies, than transition economies that experienced positive growth. Though the sample sizes are small and variable, the differences are always in the same direction, and often significant at conventional levels. This suggests that the measures of labor market distortions of type proposed in this paper and in Locay (2003) do appear to be related to economic performance during transitions to market economies, though of course it may be through a mechanism other than the overestimate of human capital.8 Regardless of the mechanism, these finding do not bode well for Cuba. Cuba deviates from other countries of Latin America by magnitudes that are usually similar to those of the poorer growth performers among the transition economies. Furthermore, Cuba shares the pattern of few workers in trade and services, and few graduates in law and business that are characteristic of the worst performers. Though these results are encouraging (in a research sense), the small sample sizes are a limiting factor. It would be valuable if the sample could be increased to include more countries, especially from the former Soviet Union. Such an expansion would help test the robustness of the results in this paper, as well as allow us to pursue further other lines of inquiry. It would be interesting, for example, to see if positive deviations, representing excess persons in a given category, have the same impact on performance during the transition as do negative deviations. I was surprised to find that the lack workers in trade appeared more related to low growth than surpluses in other categories. 1. I use the term “centrally planned economies” loosely. By it I mean societies controlled by a communist party, where the central government directed most economic activity. 3. Some of the countries may technically be in Asia. 4. Included with agriculture are forestry and fishing. Quarrying is included with mining. 5. Cuba’s sum of squared deviations is higher than in Table 1 because Cuba is not included in the sample used to compute the deviations. 6. Compare, for example, Cuba’s percentage of students versus graduates in health care. 7. I randomly shuffled the growth rates and obtained several large correlations. 8. Distortions in the labor market may be correlated with other distortions or impediments to reform.